Buildings in Bodie, CA. Photo by Kathy Weiser-Alexander. Click for prints, downloads and products. Legends about Bodie abound, including the Bodie Curse. Supposedly, if visitors take anything from this old ghost town – even a pebble, they will be cursed with bad luck. Misfortune and tragedy are heaped upon the victim until the stolen item is returned. According to Park Rangers, many who have taken things eventually return them to the park to rid themselves of this curse. Purportedly, the park maintains a log book of pages and pages of returned items. In the museum, you can see the letters from people who have returned items to the park. The curse is supposedly perpetuated by the ghosts of Bodie who guard against thieves and protect its treasures. Some believe that the “curse” is nothing more than a superstition perpetuated by the Park Rangers to preserve Bodie as a historic site. However, I for one wouldn’t take the chance of being haunted by the long lost souls of Bodie. Other ghostly legends have seemingly occurred in this ghost town that is said to truly be a “ghost” town, remaining home to several restless spirits. The J.S. Cain house at the corner of Green and Park streets is said to be haunted by the ghost of a Chinese maid. Families of Park Rangers, who have occupied the house, describe the spirit as not liking adults, but loves children. Adults sleeping in the house have said that they will awake in the night to find the “heavy set” Chinese woman sitting on them. Feeling suffocated, one woman fought so hard that she ended up on the floor. Others have reported seeing the bedroom door opening and closing on its own. The Gregory House is also said to be haunted by the ghost of an old woman. Guests and staff have reported seeing her sitting in a rocking chair, knitting an afghan. At other times, the rocking chair has been seen rocking on its own accord. The Mendocini House is called home to several friendly ghosts. One is thought to Mrs. Mendocini who loved to cook her Italian food. Rangers report today that they often smell the delicious aroma of her cooking when they enter the house. Others have reported party-like sounds coming from the next room and children’s laughter of children. At the Dechambeau House, visitors have seen a woman peering from an upstairs window. Grave Stone at Bodie California Cemetery. Click for prints, downloads and products. 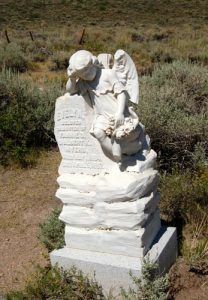 At the Bodie Cemetery is “The Angel of Bodie,” a three-year old child that was said to have been accidentally killed when she was hit in the head by a miner’s pick. Her grave is mounted with a white marble angel and on one occasion a man visiting the cemetery with his little girl, noticed that she was giggling and seemingly playing with an unseen entity. Today, Bodie is one of the largest and best preserved ghost towns in the West. Its over 200 buildings are maintained in a state of what is termed “arrested decay.” Many original items are displayed in these old buildings. When people moved out after the fire of 1932, they packed what they could get in their wagon or truck, and the rest was just left behind. Only about 10% of the original buildings still stand; however what is left looks much the same as it did over 50 years ago when the last residents left. There are no permanent residents in the town except park employees. In this original ghost town you will find no tourist traps, restaurants, or recreated saloons. 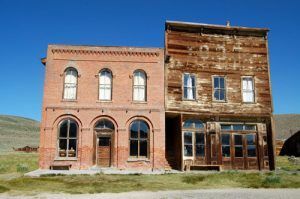 The only business is the Bodie Museum, which is free to the public and offers books, postcards and other souvenirs. Along the west slope of Bodie Bluff, you can see the Standard Mine and Mill. Most of the inner workings are still intact, some of which the public can see during a guided mill tour during summer months. The Bodie State Park is open year round weather permitting. At an elevation of almost 9,000 some connecting roads may be closed in the winter. The Bodie Museum, located in the old Miner’s Union Hall building, is open from May through October. Near the Nevada border, Bodie is 50 miles south of Lake Tahoe, California seven miles south of Bridgeport off of Highway 395. Turning on Highway 270, Bodie is 13 miles east. Highway 270 is open only sporadically in the winter time and is not paved for the final three miles to Bodie. There are several roads leading out of Bodie but these are better left traveled in four-wheel drive vehicles. All images available for photo prints & commercial downloads HERE!